APCs process heat shock protein (HSP):peptide complexes to present HSP-chaperoned peptides on class I MHC molecules, but the ability of HSPs to contribute chaperoned peptides for class II MHC (MHC-II) Ag processing and presentation is unclear. Our studies revealed that exogenous bacterial HSPs (Escherichia coli DnaK and Mycobacterium tuberculosis HSP70) delivered an extended OVA peptide for processing and MHC-II presentation, as detected by T hybridoma cells. Bacterial HSPs enhanced MHC-II presentation only if peptide was complexed to the HSP, suggesting that the key HSP function was enhanced delivery or processing of chaperoned peptide Ag rather than generalized enhancement of APC function. HSP-enhanced processing was intact in MyD88 knockout cells, which lack most TLR signaling, further suggesting the effect was not due to TLR-induced induction of accessory molecules. Bacterial HSPs enhanced uptake of peptide, which may contribute to increased MHC-II presentation. In addition, HSPs enhanced binding of peptide to MHC-II molecules at pH 5.0 (the pH of vacuolar compartments), but not at pH 7.4, indicating another mechanism for enhancement of MHC-II Ag processing. Bacterial HSPs are a potential source of microbial peptide Ags during phagocytic processing of bacteria during infection and could potentially be incorporated in vaccines to enhance presentation of peptides to CD4+ T cells. Heat shock proteins (HSPs)4 are molecular chaperones expressed by prokaryotes and eukaryotes that bind polypeptide chains, prevent aggregation, and support protein folding (1). Expression of many HSPs is increased with stress (e.g., heat, anoxia, glucose starvation). Members of the HSP70 family are constitutively expressed in eukaryotic and prokaryotic cells. This family includes Escherichia coli DnaK and Mycobacterium tuberculosis (MTB) HSP70. These HSPs bind hydrophobic regions of nascent polypeptides and unfold or disaggregate misfolded proteins to yield productive folding intermediates. Mammalian HSPs also have immunological functions (2, 3). Mammalian HSP70 (4, 5, 6, 7), HSP90 (5, 8), gp96 (5, 8, 9, 10, 11, 12), calreticulin (13, 14), and HSP110 (15) bind peptides to form highly immunogenic HSP:peptide complexes that are processed by macrophages and dendritic cells, resulting in presentation of HSP-chaperoned peptides by class I MHC (MHC-I) molecules to activate CD8+ T cells (16). Immunization with HSPs purified from tumor cells protects mice from subsequent challenge with the same tumor through activation of CD8+ T cells (2, 4, 5, 11, 13, 15). The enhanced immunogenicity conferred by mammalian HSPs requires binding of antigenic peptide to the HSP (4), and the immunogenicity of empty HSPs can be reconstituted by loading them with peptides (17). Our recent studies have established that bacterial HSPs, e.g., E. coli DnaK and MTB HSP70, are also processed by macrophages and dendritic cells for MHC-I presentation of chaperoned peptides (18). Almost all studies of immunogenicity of exogenous HSP:peptide complexes have assessed MHC-I Ag presentation and CD8+ cell responses. In contrast, little research has been performed to examine the ability of exogenous HSPs to deliver chaperoned peptides for enhanced class II MHC (MHC-II) Ag processing and presentation to activate CD4+ T cells. Heat shock enhances MHC-II Ag processing, and endogenous HSPs expressed by APCs have been proposed to contribute to MHC-II Ag processing (19, 20, 21, 22). We are aware of only a single study relating to the ability of exogenous HSP:peptide complexes to induce CD4+ T cell responses. This study demonstrated that peptide bound to MTB HSP70 enhanced delayed-type hypersensitivity (23). Specific MHC-II Ag-processing functions, however, have not been attributed to HSPs, and the ability of HSPs, either mammalian or bacterial, to promote MHC-II processing and presentation of chaperoned peptides is essentially unexplored. Peptides naturally associated with mammalian HSPs include self peptides, tumor peptides, or viral peptides, because these are derived from proteins synthesized in mammalian cells. In contrast, peptides naturally associated with bacterial HSPs include bacterial Ags, suggesting that bacterial HSPs may contribute to antibacterial CD4+ T cell responses or could be used therapeutically to generate such responses. These mechanisms could be especially important to augment host immunity to intracellular bacterial pathogens (e.g., MTB, Mycobacterium leprae, and Salmonella), because CD4+ T cells are important in the control of intracellular bacterial pathogens either directly as effector cells or as helper cells for CD8+ T cells. This study reveals that two bacterial HSPs, E. coli DnaK and MTB HSP70, are capable of delivering an extended synthetic peptide for enhanced processing and MHC-II presentation of a constituent epitope. Thus, bacterial HSPs promote MHC-II Ag processing and presentation of chaperoned peptide. We also demonstrate that HSPs increase uptake of peptide and enhance binding of peptide to MHC-II molecules at acidic pH (as found in endosomes and phagosomes). We propose that bacterial HSPs may deliver HSP-bound bacterial peptides during phagocytic processing of bacteria, thereby promoting MHC-II presentation of bacterial Ags and CD4+ T cell responses during infection with bacterial pathogens. Furthermore, this mechanism could provide a basis for use of bacterial HSPs in vaccines to enhance priming of CD4+ T cell responses. Unless otherwise specified, incubations were at 37°C and 5% CO2 in standard medium containing DMEM (Invitrogen Life Technologies, Carlsbad, CA), 10% heat-inactivated FCS (HyClone, Logan, UT), 50 μM 2-ME (BioRad, Hercules, CA), 1 mM sodium pyruvate (Invitrogen Life Technologies), 10 mM HEPES buffer (Invitrogen Life Technologies), and antibiotics. B6D2F1/J and C57BL/6 female mice were from The Jackson Laboratory (Bar Harbor, ME). H2-DM−/− mice (24) were generously provide by L. Van Kaer (Vanderbilt University, Nashville, TN). MyD88−/− mice were generously provided by O. Takeuchi and S. Akira (Osaka University, Osaka, Japan) (25) and bred onto C57BL/6 background for five to seven generations. B6D2F1/J mice were used for all experiments, except those involving knockout models, which used MyD88−/− or HLA-DM mice with C57BL/6 mice for wild-type controls. Macrophages were derived from femur marrow cells cultured in bacterial grade dishes for 7–10 days in 25% LADMAC cell-conditioned medium (containing M-CSF (26)). To produce dendritic cells (27, 28), femur marrow cells were resuspended for 10 min in 0.83% NH4Cl to lyse erythrocytes; incubated for 1 h at 4°C with combined supernatants of B hybridomas GK1.5 (anti-CD4), 53-6.72 (anti-CD8), RA3-3A1/61 (anti-B220), and 34-5-3S (anti-I-Ab/d) (American Type Culture Collection, Manassas, VA); and resuspended for 1 h at 37°C in complement (Accurate Chemical & Scientific, Westbury, NY). Cells were resuspended in RPMI 1640 (BioWhittaker, Walkersville, MD) supplemented with 5% FCS, 50 mM 2-ME, 25 mM HEPES (Invitrogen Life Technologies), 20 μg/ml gentamicin (Life Technologies), and 4 ng/ml GM-CSF (R&D Systems, Minneapolis, MN). Cells were cultured in six-well plates (3 × 106 cells/well), and nonadherent cells were removed every 2 days by gentle swirling and replacement of half of the volume with fresh medium containing GM-CSF. Dendritic cells were harvested by pipetting on day 5, incubated with anti-murine CD11c microbeads (Miltenyi Biotec, Auburn, CA; 100 μl beads/4 × 107 cells) for 20 min at 4°C, resuspended in PBS with 0.5% BSA and 2 mM EDTA (4 × 107 cells/500 μl), isolated with a MACS MS column (Miltenyi Biotec), washed, and resuspended in standard medium. E. coli DnaK (StressGen Biotechnologies, Victoria, Canada) was >90% pure by SDS-PAGE analysis, and MTB HSP70 (Lionex, Braunschweig, Germany) was >95% pure by SDS-PAGE analysis. We also prepared MTB HSP70 from E. coli BL-21 transformed with MTB HSP70 in pET-23 (Novagen, Madison, WI), obtained through the Tuberculosis Research Materials and Vaccine Testing Contract (Colorado State University, Fort Collins, CO), which drives expression of His-tagged MTB HSP70 (His tag on C terminus of MTB HSP70). E. coli were induced with isopropyl β-d-thiogalactoside for 4 h and lysed with BugBuster (Novagen). His-tagged MTB HSP70 was purified under native conditions with nickel columns (Qiagen, Valencia, CA). Similar results were obtained with MTB HSP70 (Lionex) and His-tagged MTB HSP70. Although LPS contamination was detected in HSP preparations with the E-TOXATE Limulus amebocyte lysate assay (Sigma-Aldrich, St. Louis, MO) with maximum experimental LPS concentrations of 0.22–1.1 μg/ml for E. coli DnaK and <0.14 μg/ml for MTB HSP70, control experiments without HSP, but with addition of LPS (from E. coli O127:B8; Difco, Detroit, MI) up to 1.5 μg/ml showed that LPS did not alter results or replicate HSP effects. FITC-labeled 22-mer extended OVA (319–340) peptide AESLKISQAVHAAHAEINEAGR (FITC conjugation at N terminus, 77% pure by HPLC) from Biosynthesis (Lewisville, TX) was used for all experiments, except for those with HSP:peptide complexes bound to latex beads, which used FITC-labeled 37-mer extended OVA peptide GISSAESLKISQAVHAAHAEINEAGREVVGLLVLLKK (Biosynthesis; >86% pure by HPLC). FITC-labeled extended OVA peptide (0.04 ml at 1 mM in H2O) was incubated with 0.4 ml of E. coli DnaK (StressGen Biotechnologies) or MTB HSP70 at 2 mg/ml in 40 mM Tris-HCl, pH 7.5, at 37°C with rotation for 1 h. Unbound peptide was removed using a Micron YM-10 or YM-30 centrifugal filter device (Millipore, Bedford, MA) three times for 20 min at 14,000 rpm with washes in 40 mM Tris-HCl. A negative control sample of 0.4 ml 40 mM Tris-HCl, pH 7.5, and 0.04 ml of uncomplexed peptide (1 mM) was processed to insure that unbound peptide was removed. The HSP:FITC-peptide solution was analyzed with a Spectra Fluor Plus plate fluorometer (Tecan, Research Triangle Park, NC) to determine HSP-bound peptide concentration. DnaK and MTB HSP70 bound similar amounts of peptide with ∼0.025 mol of peptide bound per mol of HSP (2.5% loading). In comparison, studies with eukaryotic HSPs reported 1–5% loading with peptide sequences from model Ag (17, 29) and 20% loading with Ag peptide containing sequences known to promote HSP binding (6). To make latex bead-HSP:peptide, protein G-Fluoresbrite YG carboxylate microspheres (one micron diameter; Polysciences, Warrington, PA) were incubated overnight at 4°C with anti-MTB HSP71 Ab (Stressgen Biotechnologies), which recognizes MTB HSP70. The microspheres were then washed, incubated with MTB HSP70:peptide for 2 h at 4°C, and washed with PBS. Macrophages were detached with trypsin-versene (BioWhittaker), plated in 96-well flat-bottom plates at 105 cells/well, and incubated with 2 ng/ml rIFN-γ (Genzyme, Cambridge, MA) for 48 h. Cells were incubated with HSP:peptide (for 45 min, unless otherwise stated), fixed with 0.5% paraformaldehyde, washed, and incubated for 24 h with DOBW T hybridoma cells (105 cells/well) (30), which recognize OVA (323–339) presented by I-Ad or I-Ab. Supernatants (100 μl) were frozen, thawed, and assessed for IL-2 using a colorimetric CTLL-2 bioassay (27, 31). Dendritic cells were subjected to the same protocol, except that plates were spun at 1800 rpm for 5 min between each wash step. Inhibitors used to probe Ag-processing mechanisms included 2-deoxy-d-glucose, chloroquine, and sodium azide (all from Sigma-Aldrich). The mAb to CD91 (5A6) was from PROGEN Biotechnik (Heidelberg, Germany), and isotype control IgG1 was from Zymed Laboratories (San Francisco, CA). Latex-OVA beads were made by noncovalent conjugation of chicken egg OVA (Sigma-Aldrich; A5503) to 2-μm latex beads (Polysciences). Macrophages were incubated in 24-well plates (6.7 × 105 cells/well) for 48 h at 37°C with 2 ng/ml IFN-γ. Hsp:FITC-labeled peptide complexes were added for 25 min. Cells were then washed in PBS, detached by scraping, fixed in 1% paraformaldehyde, and analyzed by flow cytometry. Exogenous mammalian and bacterial HSPs have been shown to deliver antigenic peptides to APCs and promote MHC-I processing and presentation of HSP-chaperoned peptides, generating CD8+ T cell responses. We propose that exogenous HSPs may also deliver peptides for MHC-II processing and presentation to generate CD4+ T cell responses. Because bacterial HSPs are associated with peptides derived from bacterial proteins, including bacterial Ags, bacterial HSPs released during phagolysosomal processing of phagocytosed bacteria could deliver bacterial Ags for MHC-II processing and presentation, contributing to antibacterial CD4+ T cell responses. MHC-II Ag processing of HSP-chaperoned peptides has not been studied with either eukaryotic or bacterial HSPs. Our studies were designed to test the hypothesis that bacterial HSPs deliver exogenous peptides for MHC-II processing and presentation of constituent epitopes. We tested whether an E. coli HSP, DnaK, could deliver a 22-mer extended OVA peptide (AESLKISQAVHAAHAEINEAGR, OVA (319–340)) for MHC-II processing and presentation of a constituent epitope (OVA (323–339)) by MHC-II. Extended OVA peptides have been used to study MHC-I processing and presentation of HSP-chaperoned peptide (8, 16, 18, 29, 32), and we adapted this strategy for studies of MHC-II presentation of HSP-chaperoned peptide. APCs were incubated for 45 min with uncomplexed extended OVA peptide or E. coli DnaK:extended OVA peptide complexes. The cells were then fixed and incubated with DOBW T hybridoma cells to detect OVA (323–339):MHC-II complexes. 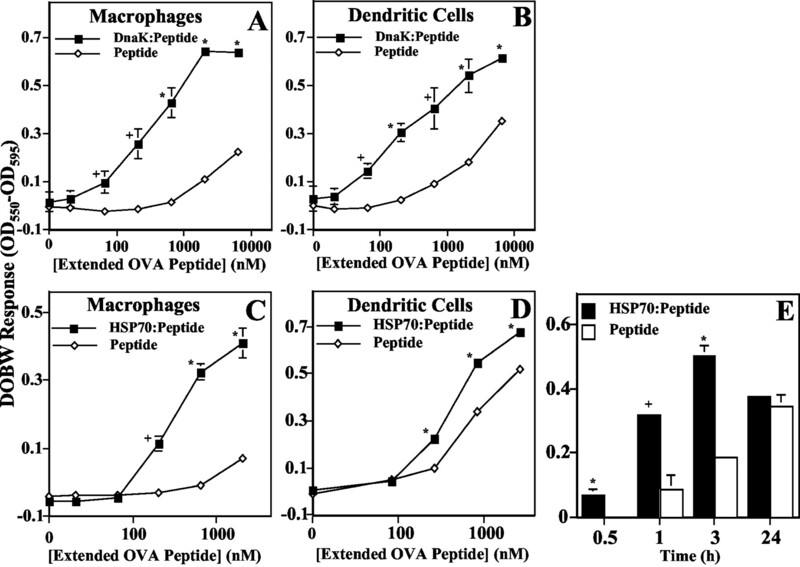 Association of extended OVA peptide with E. coli DnaK significantly enhanced presentation of the OVA (323–339) epitope from the extended peptide by both macrophages (Fig. 1⇓A) and dendritic cells (Fig. 1⇓B). We conclude that E. coli DnaK can efficiently deliver chaperoned peptide for MHC-II presentation of constituent epitopes. E. coli DnaK and MTB HSP70 enhance MHC-II Ag processing in macrophages and dendritic cells. Cells were incubated for 45 min (A, B, and D) or 60 min (C) with FITC-labeled extended OVA peptide complexed to E. coli DnaK or MTB HSP70. The cells were then fixed and incubated with OVA-specific MHC-II-restricted DOBW T hybridoma cells. Supernatants were assessed for IL-2 using a colorimetric CTLL-2 bioassay. A and B, E. coli DnaK enhances processing and presentation of extended OVA peptide by bone marrow-derived macrophages (A) and dendritic cells (B). C and D, MTB HSP70 enhances processing and presentation of extended OVA peptide by macrophages (C) and dendritic cells (D). E, MTB HSP70 produces rapid enhancement of extended OVA peptide processing by macrophages. Macrophages were incubated with 2.19 μM extended OVA peptide complexed to MTB HSP70 for the indicated periods. In this and other figures, the x-axes in panels showing dose-response experiments represent the concentration of extended OVA peptide, whether bound to HSP or uncomplexed. The results in each panel are representative of at least three independent experiments. Data points represent means of triplicate samples with SD. When error bars are not visible, they are smaller than the symbol width. Values of p resulting from a two-tailed t test comparing results with and without HSP are shown (+, p < 0.05; ∗, p < 0.01). Additional studies were performed with MTB HSP70 to determine whether the above findings were idiosyncratic to E. coli DnaK or reflected properties shared broadly among bacterial HSPs. 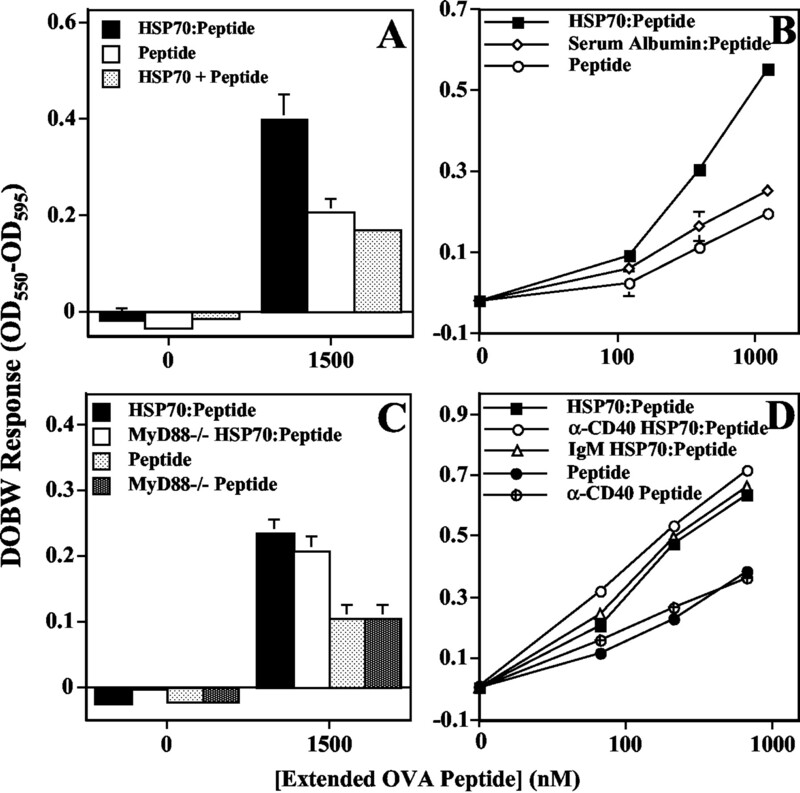 APCs were incubated with MTB HSP70:extended OVA peptide complexes for 60 min (Fig. 1⇑C) or 45 min (Fig. 1⇑D), fixed, and incubated with DOBW T hybridoma cells to detect OVA (323–339):MHC-II complexes. MTB HSP70 significantly enhanced MHC-II peptide presentation in both macrophages (Fig. 1⇑C) and dendritic cells (Fig. 1⇑D). The greatest relative enhancement of peptide presentation by MTB HSP with our readout assay was observed from 0.5–3 h of processing (Fig. 1⇑E); plateau signal (maximum response of our T cell assay) was achieved within this time frame at typical concentrations of MTB HSP70:peptide, whereas presentation of uncomplexed extended OVA remained low from 0.5–3 h, but increased at longer times (beyond 3 h it is likely that MTB HSP70:peptide continued to produce peptide:MHC-II complexes that were not evident due to signal plateau). Thus, bacterial HSPs from both E. coli and MTB can deliver extended peptide for enhanced MHC-II Ag presentation of a constituent epitope. Although HSP contributions to MHC-II Ag processing and presentation have not been examined, some immune functions have been attributed to bacterial HSPs. MTB HSP70 and chlamydial HSP60 stimulate cytokine secretion through CD40 and TLR4, respectively (33, 34). These observations suggested that modulation of MHC-II Ag processing by bacterial HSPs could be explained by HSP signaling to produce generalized enhancement of macrophage MHC-II Ag processing and presentation, regardless of whether the presented peptides were directly chaperoned by the HSP. To distinguish generalized effects of HSP signaling from enhanced processing specific to HSP-chaperoned peptide, we explored the requirement for binding of extended peptide to HSP. Macrophages were incubated for 45 min with HSP-complexed extended OVA peptide or equivalent concentrations of uncomplexed extended OVA peptide plus MTB HSP70. APCs were fixed and assessed for presentation of OVA (323–339):MHC-II complexes. The presence of MTB HSP70 did not enhance processing and presentation of uncomplexed extended OVA peptide (Fig. 2⇓A). OVA (323–339) presentation was enhanced only if exogenous extended peptide was complexed to the HSP. MTB HSP70 specifically enhances processing and MHC-II presentation of chaperoned peptide. After incubation with bacterial HSPs and extended OVA peptide, macrophages were assessed for OVA peptide presentation, as in Fig. 1⇑. A, Macrophages were incubated for 45 min with MTB HSP70 complexed to extended OVA peptide (HSP70:Peptide) or uncomplexed extended OVA peptide alone. Alternatively, macrophages were incubated for 45 min with uncomplexed extended OVA peptide and MTB HSP70 (HSP70 + Peptide). B, Macrophages were incubated for 45 min with extended OVA peptide complexed to MTB HSP70, extended OVA peptide complexed to BSA, or uncomplexed extended OVA peptide. C, Macrophages from MyD88−/− and wild-type C57BL/6 mice were incubated for 45 min with extended OVA peptide, either alone or complexed with MTB HSP70. D, Macrophages were preincubated with blocking mAb to CD40 (α-CD40; 50 μg/ml) or isotype control Armenian hamster IgM (IgM; 50 μg/ml) for 30 min before and during a 45-min incubation with HSP:extended OVA peptide complexes. Presentation of extended OVA peptide without HSP was the same in the presence of either isotype control Ab or CD40-blocking Ab (data not shown due to overlapping symbols). The results in each panel are representative of at least three independent experiments. Data points represent means of triplicate samples with SD. When error bars are not visible, they are smaller than the symbol width. To determine whether enhanced MHC-II processing and presentation of chaperoned peptide were related to specific HSP properties, we compared MHC-II presentation of OVA (323–339) after exposure of macrophages to extended OVA peptide bound to HSP or BSA (BSA bound peptide, as reported previously (29)). APCs were incubated with MTB HSP70:extended OVA peptide complexes or BSA:extended OVA peptide complexes for 45 min, fixed, and incubated with DOBW T hybridoma cells to detect OVA (323–339):MHC-II complexes. MTB HSP70 significantly enhanced MHC-II peptide presentation, but BSA did not enhance MHC-II peptide presentation in macrophages (Fig. 2⇑B). Thus, HSP enhancement of Ag presentation was related to the ability of HSPs to promote processing or presentation of chaperoned peptide. We performed experiments to determine whether TLR- and MyD88-dependent signaling by HSPs or potential microbial contaminants of bacterial HSP preparations (e.g., LPS) altered APC function to cause HSP enhancement of peptide presentation. LPS was excluded as a significant factor in our experiments, because LPS (up to 1.5 μg/ml, higher than maximal levels of LPS from HSP preparations) did not affect the processing of extended OVA peptide (data not shown). In addition, enhancement of MHC-II peptide presentation by MTB HSP70 was identical with wild-type and MyD88−/− macrophages (Fig. 2⇑C). Finally, enhancement of MHC-II peptide presentation by MTB HSP70 was not affected by anti-CD40-blocking Ab (Fig. 2⇑D). Although HSPs have been reported to signal through TLRs or CD40 to stimulate proinflammatory cytokines (33, 34, 35, 36, 37), our data indicate that enhancement of peptide presentation was not the result of signaling by HSPs or bacterial contaminants to alter overall processing functions of APCs. Furthermore, HSP-enhanced processing was specific to the HSP-chaperoned extended peptide that was delivered for processing and MHC-II presentation. We tested whether bacterial HSP-chaperoned peptides required active processing, e.g., through endocytosis by viable APCs, or could be delivered directly to cell surface MHC-II molecules. To distinguish active processing from cell surface events, uptake and processing functions were inhibited by fixation or metabolic inhibition of APCs. Fixation of macrophages before addition of extended OVA peptide prevented enhancement of MHC-II peptide presentation by MTB HSP70 (Fig. 3⇓A). Experiments with dendritic cells produced similar results; prefixation of dendritic cells prevented enhancement of MHC-II peptide presentation by MTB HSP70 (data not shown). Alternatively, macrophages were exposed to sodium azide and 2-deoxy-d-glucose for 90 min to deplete ATP and subsequently incubated with MTB HSP70:extended OVA peptide complexes for 45 min. This metabolic inhibition blocked enhancement of extended OVA peptide processing and presentation by MTB HSP70 (Fig. 3⇓B). Macrophages were also exposed to chloroquine for 30 min to neutralize the pH of vacuolar compartments and subsequently incubated with MTB HSP70:extended OVA peptide complexes for 45 min. Chloroquine also blocked enhancement of extended OVA peptide processing and presentation by MTB HSP70 (Fig. 3⇓C). Presentation of uncomplexed peptide was reduced by fixation or metabolic inhibition (Fig. 3⇓, A–C), possibly reflecting loss of active peptide uptake, but sufficient signal remained to determine that HSP enhancement did not occur under these conditions. Thus, active APC function or processing was required for HSP enhancement of peptide presentation. Active processing by APCs is required for MTB HSP70 to enhance MHC-II peptide presentation. Macrophages were exposed to inhibitors before and during incubation with MTB HSP70:extended OVA peptide complexes for 45 min. 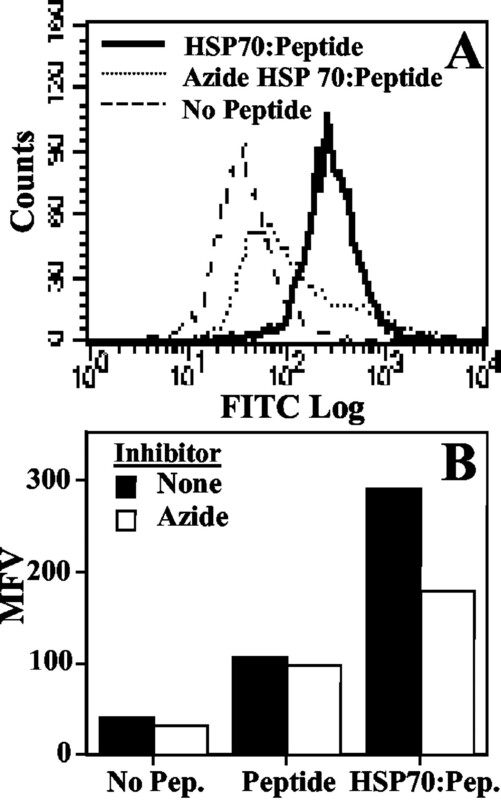 The cells were then fixed and assessed for presentation of OVA (323–339):MHC-II complexes, as in Fig. 1⇑. A, Macrophages were fixed with 0.5% paraformaldehyde before incubation with MTB HSP70:peptide complexes. B, Macrophages were exposed to 30 mM sodium azide and 5 mM deoxy-d-glucose for 90 min before and during incubation with MTB HSP70:peptide complexes. C, Macrophages were exposed to 0.1 mM chloroquine for 30 min before and during incubation with MTB HSP70:peptide complexes. D, Macrophages were exposed to 10 μg/ml cytochalasin D for 15 min before and during a 30-min incubation with MTB HSP70:peptide complexes linked to protein G-coated latex beads by anti-MTB HSP70 Ab. Macrophages were then washed and incubated for 90 min with or without cytochalasin D. E, Macrophages were exposed to 10 μg/ml cytochalasin D for 15 min before and during incubation with soluble extended OVA peptide and processed as in D. F, Macrophages from HLA-DM−/− and wild-type C57BL/6 mice were incubated for 45 min with extended OVA peptide, either alone or complexed with MTB HSP70. The results in each panel are representative of three independent experiments. Data points represent means of triplicate samples with SD. When error bars are not visible, they are smaller than the symbol width. To confirm that bacterial HSPs enhance Ag processing through an active process involving cellular uptake, we attached HSP:peptide complexes to latex beads and used cytochalasin D to inhibit actin-dependent phagocytosis of these beads (Fig. 3⇑D). Cytochalasin D inhibits actin-dependent phagocytosis of particles such as latex beads, but does not inhibit endocytosis of soluble proteins, which is not dependent on actin microfilament function. Thus, to make uptake of HSP70:peptide sensitive to cytochalasin D, we conjugated it to 1-μm diameter latex beads. Macrophages were incubated with or without cytochalasin D for 15 min before and during incubation with bead-conjugated MTB HSP70:extended OVA peptide. 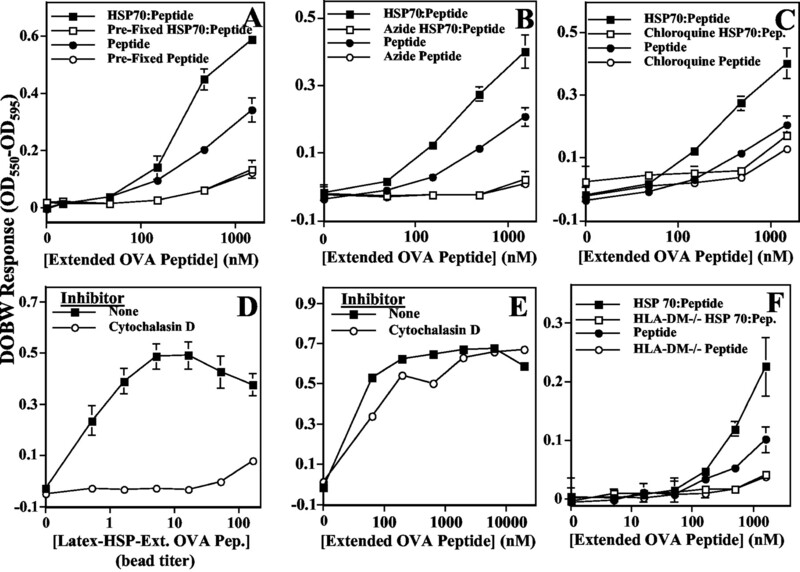 Cytochalasin D significantly inhibited processing of MTB HSP70:extended OVA peptide beads (Fig. 3⇑D). Control samples showed that cytochalasin D completely blocked phagocytic alternate MHC-I processing of whole OVA protein conjugated to latex beads (data not shown), as previously observed (38, 39). Presentation of uncomplexed extended OVA peptide was unaltered by cytochalasin D, indicating that cytochalasin D did not cause general loss of macrophage peptide presentation function (Fig. 3⇑E). This experiment confirms and extends conclusions from experiments shown in Fig. 3⇑, A–C, using an independent approach. Because bacterial HSP enhancement of extended OVA peptide processing and presentation is abolished in macrophages that are unable to internalize or actively process HSP:peptide complexes, we conclude that MTB HSP70 peptide complexes must enter the acidic environment of intracellular vacuolar compartments to access MHC-II Ag processing mechanisms to which HSP-chaperoned Ag can contribute. To examine the molecular requirements for efficient processing of bacterial HSP:peptide complexes, HLA-DM−/− macrophages were used. HLA-DM is expressed inside endosomal compartments and is required for removal of class II-associated invariant chain peptide and subsequent loading of MHC-II molecules with peptides. Enhancement of MHC-II peptide presentation by MTB HSP70 was abolished in macrophages that lacked HLA-DM (Fig. 3⇑F). Enhancement of MHC-II Ag processing by bacterial HSPs could be mediated by enhanced uptake of peptide Ag as well as enhanced intracellular processing mechanisms. To assess whether E. coli DnaK or MTB HSP70 enhance uptake of extended OVA peptide, macrophages were incubated with FITC-labeled extended OVA peptide either uncomplexed or complexed with bacterial HSP. Flow cytometry was used to determine the level of FITC-peptide uptake. In negative control samples, APCs were incubated with metabolic inhibitors (azide and 2-deoxy-d-glucose) for 90 min before and during the peptide incubation to inhibit endocytosis. MTB HSP70:peptide complexes produced a strong signal for peptide uptake with mean fluorescence value (MFV) of 293, and metabolic inhibitors reduced uptake to ∼62% of this level (MFV = 182) (Fig. 4⇓). In contrast, uptake of extended OVA peptide without HSP was much lower (MFV = 109) and was not substantially affected by addition of metabolic inhibitors (MFV = 99). Similarly, E. coli DnaK:extended OVA peptide promoted peptide uptake that was reduced by metabolic inhibitors to baseline uptake level (data not shown). In addition, MTB HSP70 enhanced uptake of chaperoned peptides by dendritic cells, similar to the results seen with macrophages (data not shown). In summary, MTB HSP70 and E. coli DnaK enhanced uptake of chaperoned extended OVA peptide through a mechanism that was reduced by metabolic inhibitors. Thus, bacterial HSPs mediate enhanced delivery of peptide Ags to APCs, and this mechanism may contribute to enhancement of MHC-II Ag processing and presentation. MTB HSP70 enhances uptake of chaperoned peptides. Macrophages were incubated with or without 30 mM sodium azide and 5 mM deoxy-d-glucose for 90 min before and during incubation for 25 min with FITC-labeled extended OVA peptide bound to HSP (6.96 μM final peptide concentration). The cells were then washed, fixed, and analyzed for uptake of FITC-labeled extended OVA peptide by flow cytometry. A, Representative histogram of MTB HSP70-enhanced uptake of extended OVA peptide. B, MFVs for MTB HSP70 enhancement of peptide uptake. Each panel is representative of three independent experiments. In addition to enhancement of peptide uptake, bacterial HSPs may have active roles inside APCs to deliver peptides to MHC-II for binding and presentation. Although bacterial HSPs failed to deliver peptides to surface MHC-II molecules at neutral pH (Fig. 3⇑A), we tested whether they could enhance loading of MHC-II at acidic pH (5.0) similar to that found in vacuolar compartments. 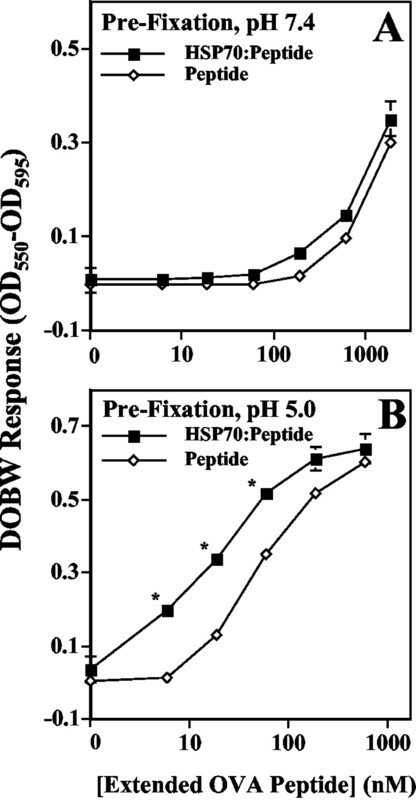 APCs were fixed with paraformaldehyde, resuspended in citrate buffered saline at either pH 5.0 or 7.4, incubated with MTB HSP70:extended OVA peptide complexes for 45 min, fixed, and incubated with DOBW T hybridoma cells to detect OVA peptide:MHC-II complexes. At pH 7.4, MTB HSP70 did not enhance formation of OVA peptide:MHC-II complexes beyond the background level observed in the absence of MTB HSP70 (Fig. 5⇓A). At pH 5.0, however, MTB HSP70 enhanced formation of OVA peptide:MHC-II complexes (Fig. 5⇓B). These results indicate that bacterial HSPs can assist in MHC-II peptide loading in acidic environments. The binding of uncomplexed peptide was higher at pH 5.0 than pH 7.4 (Fig. 5⇓, A vs B), consistent with previous observations that MHC-II molecules optimally bind or exchange peptides under acidic conditions (40, 41), but HSP-complexed peptide produced even greater binding of peptide to MHC-II. Thus, acidic vacuolar pH may promote release of HSP-chaperoned peptides and their binding to MHC-II molecules. MTB HSP70 enhances MHC-II peptide presentation in acidic environments. Macrophages were fixed, incubated with MTB HSP70:extended OVA complexes in citrate buffered saline at pH 7.4 (A) or 5.0 (B) for 30 min, fixed again, and assessed for presentation of MHC-II:OVA complexes, as in Fig. 1⇑. Data points represent means of triplicate samples with SD. The results in each panel are representative of at least three independent experiments. When error bars are not visible, they are smaller than the symbol width. Values of p resulting from a two-tailed t test comparing results with and without HSP are shown (∗, p < 0.01). HSPs enhance alternate MHC-I Ag processing of chaperoned self, tumor, or viral peptides (reflecting the range of proteins synthesized by mammalian cells) to promote MHC-I cross presentation and CD8+ T cell responses (2, 4, 5, 6, 11, 13, 15, 16). It has also been demonstrated that overexpression of endogenous mammalian HSPs can enhance MHC-II presentation to CD4+ T cells (19, 20, 21, 22), although specific Ag-processing functions to which HSPs may contribute have not been addressed. Furthermore, MHC-II processing of exogenous HSP:complexes, either mammalian or bacterial, has not been studied. In particular, there have been no studies to test whether bacterial HSPs, which are naturally associated with bacterial peptides, deliver chaperoned peptides for MHC-II Ag processing and presentation. The microbial peptides that are chaperoned by bacterial HSPs are a potentially important source of Ag to promote antimicrobial immunity. We propose that microbicidal mechanisms cause release of bacterial HSPs from phagocytosed bacteria, potentially delivering antigenic HSP-chaperoned bacterial peptides into the phagolysosomal environment for processing and binding to MHC-II. In addition, bacterial HSPs released into the extracellular space (secondary to lysis of bacteria by complement or other mechanisms) may be internalized by APCs, allowing MHC-II processing of HSP-chaperoned bacterial Ags. In this study, we demonstrate that exogenous bacterial HSPs (E. coli DnaK and MTB HSP70) enhance uptake and MHC-II Ag processing of a chaperoned model peptide. Some HSPs may stimulate signaling (e.g., chlamydial HSP60 signaling via TLR 4 (34) and MTB HSP70 signaling via CD40 (33, 37)) to increase expression of accessory factors (e.g., cytokines or costimulators), which may be important in vivo for generating responses by primary T cells. Our data establish a different mechanism whereby bacterial HSPs contribute directly to generation of peptide:MHC-II complexes from HSP-chaperoned peptide Ag (as detected by T hybridoma cells, which are less dependent on costimulatory molecules). This mechanism requires that peptides be complexed to the HSP and is independent of MyD88 and CD40. Thus, this enhancement by HSPs does not involve a generalized increase in MHC-II Ag presentation, but specifically involves the delivery of HSP-chaperoned peptides for processing and presentation by MHC-II. Two potential mechanisms that could explain enhancement of MHC-II Ag processing by bacterial HSPs are increased uptake and enhanced intracellular processing. Both of these mechanisms are supported by our observations. Uptake of peptide complexed to either E. coli DnaK or MTB HSP70 was significantly higher than uptake of uncomplexed peptide as measured by flow cytometry. In some systems, CD91 has been reported to be involved in uptake of exogenous HSP:peptide complexes for alternate MHC-I processing and presentation (10, 18, 42), but MHC-II processing of MTB HSP70:peptide complexes was not altered by the addition of anti-CD91-blocking Ab (data not shown). The reason for this difference is unknown, but intracellular trafficking of CD91 and differences in compartmentalization of MHC-II and alternate MHC-I processing may contribute. These observations coupled with the finding that bacterial HSP enhanced uptake of peptide in the present studies suggest that receptors other than CD91 may also be involved in uptake of HSPs. In addition to assisting in uptake, bacterial HSPs may enhance intracellular processing of chaperoned Ag. Although bacterial HSPs did not enhance binding of peptide to MHC-II at neutral pH, HSP-enhanced binding was evident at pH 5.0. Thus, HSPs may release chaperoned peptides at the acidic pH of vacuolar compartments, making these peptides available for binding to MHC-II. We speculate that this could involve direct interactions between HSPs and MHC-II, leading to release of chaperoned peptide, but this hypothesis requires future experimental testing. It is interesting to note that MHC-II molecules optimally bind or exchange peptides under acidic conditions (40, 41). Thus, acidic vacuolar pH may promote both release of HSP-chaperoned peptides and their binding to MHC-II molecules. We propose that bacterial HSPs deliver antigenic HSP-chaperoned peptide Ags that contribute to the generation of CD4+ T cell responses during infection of mammalian hosts with bacterial pathogens. This mechanism could be particularly important during infection with bacterial pathogens for which CD4+ T cell responses contribute to host immunity. APCs may encounter bacterial HSPs following phagocytosis and phagolysosomal degradation of bacteria, which may release bacterial HSPs directly into the phagosomal Ag-processing environment (where MHC-II molecules are present). Alternatively, bacterial HSPs that have been released in the extracellular space by microbicidal mechanisms (e.g., complement) may be internalized for subsequent intracellular processing and MHC-II presentation. In addition to physiological roles in processing of bacterial Ags, bacterial HSPs have the potential to contribute to vaccine efficacy. HSPs, including bacterial HSPs, could be incorporated in vaccines to stimulate CD4+ T cell responses that are crucial to immune responses against bacteria. We thank W. Henry Boom for helpful advice and guidance, Mike Sramkoski for assistance with flow cytometry, Susanne Mohr for help with fluorometry, S. Akira for providing MyD88−/− mice, and Nancy Nagy for technical support. ↵1 This work was supported by National Institutes of Health Grants AI34343, AI35726, and AI47255 (to C.V.H. ), and AI01581 (to D.H.C.). D.H.C. was also supported by the American Lung Association. A.A.R.T. was supported by National Institutes of Health Training Grants T32 CA73515 and T32 GM07250. ↵2 D.H.C. and C.V.H. share senior authorship. ↵4 Abbreviations used in this paper: HSP, heat shock protein; MHC-I, class I MHC; MHC-II, class II MHC; MFV, mean fluorescence value; MTB, Mycobacterium tuberculosis. Bukau, B., A. L. Horwich. 1998. The Hsp70 and Hsp60 chaperone machines. Cell 92:351. Singh-Jasuja, H., N. Hilf, D. Arnold-Schild, H. Schild. 2001. The role of heat shock proteins and their receptors in the activation of the immune system. Biol. Chem. 382:629. Udono, H., P. K. Srivastava. 1993. Heat shock protein 70-associated peptides elicit specific cancer immunity. J. Exp. Med. 178:1391. Udono, H., P. K. Srivastava. 1994. Comparison of tumor-specific immunogenicities of stress-induced proteins Gp96, Hsp90 and Hsp70. J. Immunol. 152:5398. Castellino, F., P. E. Boucher, K. Eichelberg, M. Mayhew, J. E. Rothman, A. N. Houghton, R. N. Germain. 2000. Receptor-mediated uptake of antigen/heat shock protein complexes results in major histocompatibility complex class I antigen presentation via two distinct processing pathways. J. Exp. Med. 191:1957. Ciupitu, A. M., M. Petersson, C. L. O’Donnell, K. Williams, S. Jindal, R. Kiessling, R. M. Welsh. 1998. Immunization with a lymphocytic choriomeningitis virus peptide mixed with heat shock protein 70 results in protective antiviral immunity and specific cytotoxic T lymphocytes. J. Exp. Med. 187:685. Binder, R. J., M. L. Harris, A. Menoret, P. K. Srivastava. 2000. Saturation, competition, and specificity in interaction of heat shock proteins (HSP) gp96, HSP90, and HSP70 with CD11b+ cells. J. Immunol. 165:2582. Berwin, B., M. F. Rosser, K. G. Brinker, C. V. Nicchitta. 2002. Transfer of GRP94(Gp96)-associated peptides onto endosomal MHC class I molecules. Traffic 3:358. Binder, R., D. Han, P. Srivastava. 2000. CD91: a receptor for heat shock protein gp96. Nat. Immunol. 1:151. Udono, H., D. L. Levey, P. K. Srivastava. 1994. Cellular requirements for tumor-specific immunity elicted by heat-shock proteins: tumor rejection antigen-Gp96 primes CD8+ T cells in vivo. Proc. Natl. Acad. Sci. USA 91:3077. Arnold, D., S. Raath, H.-G. Rammensee, H. Schild. 1995. Cross-priming of minor histocompatibility antigen-specific cytotoxic T cells upon immunization with the heat shock protein gp96. J. Exp. Med. 182:885. Basu, S., P. K. Srivastava. 1999. Calreticulin, a peptide-binding chaperone of the endoplasmic reticulum, elicits tumor- and peptide-specific immunity. J. Exp. Med. 189:797. Nair, S., P. A. Wearsch, D. A. Mitchell, J. J. Wassenberg, E. Gilboa, C. V. Nicchitta. 1999. Calreticulin displays in vivo peptide-binding activity and can elicit CTL responses against bound peptides. J. Immunol. 162:6426. Wang, X. Y., Y. Li, M. H. Manjili, E. A. Repasky, D. M. Pardoll, J. R. Subjeck. 2002. Hsp110 over-expression increases the immunogenicity of the murine CT26 colon tumor. Cancer Immunol. Immunother. 51:311. Suto, R., P. K. Srivastava. 1995. A mechanism for the specific immunogenicity of heat shock protein-chaperoned peptides. Science 269:1585. Blachere, N. E., Z. Li, R. Y. Chandawarkar, R. Suto, N. S. Jaikaria, S. Basu, H. Udono, P. K. Srivastava. 1997. Heat shock protein-peptide complexes, reconstituted in vitro, elicit peptide-specific cytotoxic T lymphocyte response and tumor immunity. J. Exp. Med. 186:1315. Tobian, A. A. R., D. H. Canaday, W. H. Boom, C. V. Harding. 2004. Bacterial heat shock proteins promote CD91-dependent class I MHC cross presentation of chaperoned peptide to CD8+ T cells by cytosolic mechanisms in dendritic cells versus vacuolar mechanisms in macrophages. J. Immunol. 172:5277. Vanbuskirk, A., B. L. Crump, E. Margoliash, S. K. Pierce. 1989. A peptide binding protein having a role in antigen presentation is a member of the HSP70 heat shock family. J. Exp. Med. 170:1799. Vanbuskirk, A. M., D. C. De Nagel, L. E. Guagliardi, F. M. Brodsky, S. K. Pierce. 1991. Cellular and subcellular distribution of PBP72/74, a peptide-binding protein that plays a role in antigen processing. J. Immunol. 146:500. Cristau, B., P. H. Schafer, S. K. Pierce. 1994. Heat shock enhances antigen processing and accelerates the formation of compact class II αβ dimers. J. Immunol. 152:1546. Mycko, M. P., H. Cwiklinska, J. Szymanski, B. Szymanska, G. Kudla, L. Kilianek, A. Odyniec, C. F. Brosnan, K. W. Selmaj. 2004. Inducible heat shock protein 70 promotes myelin autoantigen presentation by the HLA class II. J. Immunol. 172:202. Roman, E., C. Moreno. 1997. Delayed-type hypersensitivity elicited by synthetic peptides complexed with Mycobacterium tuberculosis HSP 70. Immunology 90:52. Martin, W. D., G. G. Hicks, S. K. Mendiratta, H. I. Leva, H. E. Ruley, L. Van Kaer. 1996. H2-M mutant mice are defective in the peptide loading of class II molecules, antigen presentation, and T cell repertoire selection. Cell 84:543. Sklar, M. D., A. Tereba, B. D. Chen, W. S. Walker. 1985. Transformation of mouse bone marrow cells by transfection with a human oncogene related to c-myc is associated with the endogenous production of macrophage colony stimulating factor 1. J. Cell. Physiol. 125:403. Askew, D., R. S. Chu, A. M. Krieg, C. V. Harding. 2000. CpG DNA induces maturation of dendritic cells with distinct effects on nascent and recycling MHC-II antigen processing mechanisms. J. Immunol. 165:6889. Binder, R. J., D. Karimeddini, P. K. Srivastava. 2001. Adjuvanticity of α2-macroglobulin, an independent ligand for the heat shock protein receptor CD91. J. Immunol. 166:4968. Harding, C. V., D. S. Collins, O. Kanagawa, E. R. Unanue. 1991. Liposome-encapsulated antigens engender lysosomal processing for class II MHC presentation and cytosolic processing for class I presentation. J. Immunol. 147:2860. Ahmed, S. A., R. M. Gogal, Jr, J. E. Walsh. 1994. A new rapid, and simple non-radioactive assay to monitor and determine the proliferation of lymphocytes: an alternative to 3H-thymidine incorporation assay. J. Immunol. Methods 170:211. Suzue, K., X. Zhou, H. N. Eisen, R. A. Young. 1997. Heat shock fusion proteins as vehicles for antigen delivery into the major histocompatibility complex class I presentation pathway. Proc. Natl. Acad. Sci. USA 94:13146. Wang, Y., C. G. Kelly, J. T. Karttunen, T. Whittall, P. J. Lehner, L. Duncan, P. MacAry, J. S. Younson, M. Singh, W. Oehlmann, et al 2001. CD40 is a cellular receptor mediating mycobacterial heat shock protein 70 stimulation of CC-chemokines. Immunity 15:971. Bulut, Y., E. Faure, L. Thomas, H. Karahashi, K. S. Michelsen, O. Equils, S. G. Morrison, R. P. Morrison, M. Arditi. 2002. Chlamydial heat shock protein 60 activates macrophages and endothelial cells through Toll-like receptor 4 and MD2 in a MyD88-dependent pathway. J. Immunol. 168:1435. Asea, A., M. Rehli, E. Kabingu, J. A. Boch, O. Bare, P. E. Auron, M. A. Stevenson, S. K. Calderwood. 2002. Novel signal transduction pathway utilized by extracellular HSP70: role of Toll-like receptor (TLR) 2 and TLR4. J. Biol. Chem. 277:15028. Wang, Y., C. G. Kelly, M. Singh, E. G. McGowan, A. S. Carrara, L. A. Bergmeier, T. Lehner. 2002. Stimulation of Th1-polarizing cytokines, C-C chemokines, maturation of dendritic cells, and adjuvant function by the peptide binding fragment of heat shock protein 70. J. Immunol. 169:2422. Pfeifer, J. D., M. J. Wick, R. L. Roberts, K. F. Findlay, S. J. Normark, C. V. Harding. 1993. Phagocytic processing of bacterial antigens for class I MHC presentation to T cells. Nature 361:359. Harding, C. V., R. Song. 1994. Phagocytic processing of exogenous particulate antigens by macrophages for presentation by class I MHC molecules. J. Immunol. 53:4925. Harding, C. V., R. W. Roof, P. M. Allen, E. R. Unanue. 1991. Effects of pH and polysaccharides on peptide binding to class II major histocompatibility complex molecules. Proc. Natl. Acad. Sci. USA 88:2740. Jensen, P. E.. 1990. Regulation of antigen presentation by acidic pH. J. Exp. Med. 171:1779. Basu, S., R. J. Binder, T. Ramalingam, P. K. Srivastava. 2001. CD91 is a common receptor for heat shock proteins gp96, HSP90, HSP70, and calreticulin. Immunity 14:303.